> Webtrends > CMOs' Advice: Common Digital Problems and New Ideas for Improvement. 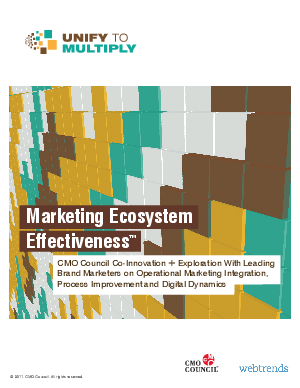 Today’s increasingly complex, distributed and digitally driven marketing ecosystem is challenging global marketers to better integrate and manage data, best of breed solutions, creative resources, brand assets and go-to-market functions. Marketing process improvement, efficiency and yield is directly tied to more effective use of tools, platforms, analytics and intelligence that improve rich media content creation, relevancy, delivery, access, control, workflow, partner collaboration, market engagement, sales lead provisioning, as well as campaign measurement and tracking. During 2010, CMO Council members and Marketing Supply Chain Institute contributors provided insights and experiences from the packaged goods, financial services, consumer electronics, information technology, apparel, consumer durables and automotive sectors. And more than 25 senior marketers were interviewed one-on-one to gather qualitative perspectives. These included Allstate, BASF, Clorox, Colgate-Palmolive, Del Monte Foods, FedEx, GSK, Harris Bank (BMO Group), Heineken USA, Heinz, The Hershey Company, HP, Golfsmith, OfficeMax, Redken (L’Oreal), The Ritz-Carlton Carlton Group, SanDisk, Sara Lee, Subway, Tweezerman International, UniLever, Victoria’s Secret, Viking Range, Wendy’s International and Zappos.com. The discussions covered: 1) critical marketing automation drivers 2) nature and range of analytics needs (market research, customer behavior, website, market listening and feedback, campaign performance, predictive modeling) 3) level of alignment and cooperation with IT groups 4) value and integration of current applications and point solutions 5) issues and challenges with go-to-market processes 6) operational marketing and digital campaign management requirements and 7) areas for marketing supply chain and ecosystem improvement, integration and control.